Plus ça change, plus c'est la même chose! With the rise in the use of gender quotas at electoral level, and the emergence of excellent groups such as Women in Election, we thought it would be fun to compile a list of guidelines for women thinking of entering campaigning for the first time. The advice below first appeared in a journal for women in 1874, and are still pretty relevant today! Scroll on down for the full story. Thomas and Anna Haslam by Sarah Harrison, 1908. Hugh Lane Gallery Dublin. What was The Women’s Advocate and who was Thomas Haslam? The woman who spearheaded the earliest campaign for votes for women in Dublin was Anna Haslam, and her husband was Thomas. Their biggest contribution to the movement was their founding of the Dublin Women’s Suffrage Association (DWSA) in 1876. Anna remained Secretary of the Association for the next several decades, diligently attending and minuting every meeting. She and Thomas shared a belief in equality for the sexes in all spheres of life. Two years before forming the DWSA, Thomas undertook to produce a regular pamphlet. It was called The Women’s Advocate, and three issues were edited and printed, before the venture was wound up. The first came out in April of 1874, the second came out in May, and the third (and last) was issued in July. It was an early example of an Irish suffrage journal - the next would not appear for nearly forty years (this was the wonderfully diverse Irish Citizen, which would run for eight years, and which we mention regularly in these blog posts!). 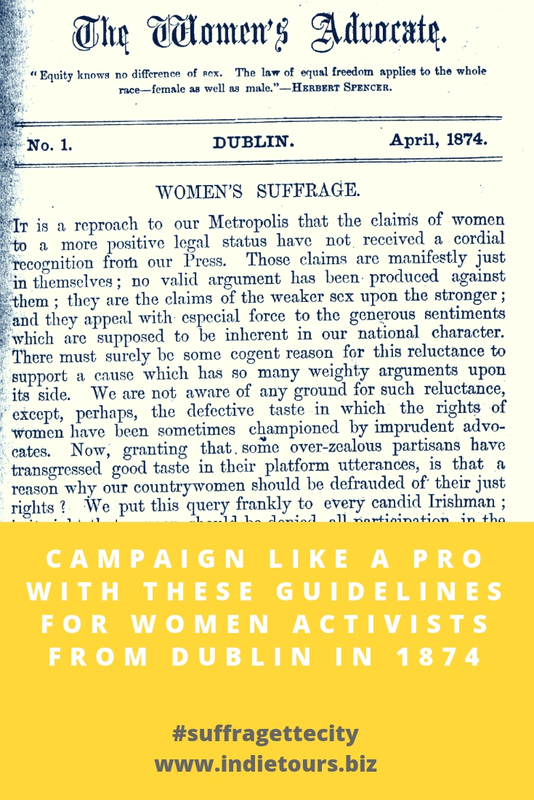 The first edition of The Women’s Advocate, in April 1874, was addressed to the men of Ireland, and asked them to help women in their political cause so that the women would not have to step out of (what those men saw as) their natural environment and behaviour. The third edition, in July 1874, was a specific retort against an anti-suffrage column that another newspaper had published. The second edition, in May 1874, is the one that concerns us here. It laid out practical advice for women who were considering entering into the areas of political lobbying, protest activities, or seeking to represent. Header of The Women’s Advocate. Source. The full text of the second issue of The Women’s Advocate has thankfully been reproduced for us in one of the Field Day Anthologies - link here to read it; if you are lucky Google Books will offer you a preview so you can go straight to that page (75). Instead of reproducing Thomas’ prose below, here is a bullet list of extracts, in what we imagine to be listed in a relevant and helpful way for today’s political woman! Irish Citizen Saturday 21 March 1914. Check out the fabulous poem to the right too - we are especially loving the idea of an annual honeymoon?! The DWSA pursued tactics such as those listed above, consistently and patiently, until a limited (but very large) suffrage was granted to women in 1918. Along the way, they had a fantastic victory in 1898, when the right for women to stand for election as district councillors and poor law guardians was legislated for. This win reinvigorated the suffrage campaign and drove it forward into the early twentieth century. Thomas’ pamphlet was influential beyond the members of the DWSA, however. In an interview with The Irish Citizen in 1914, the Haslams revealed that this second issue of The Women’s Advocate was popular in England too, where 5,000 copies of it had been distributed by the movement there. What could be achieved if it was redistributed today, we wonder! Did you enjoy this blogpost? Why not have the next one arrive straight into your inbox! Pop your email address in below, and that’s what we’ll do. Quinlan, Carmel. ‘The nineteenth century Irish campaign for votes for women’ in Becoming Citizens (2018 edition). The Field Day Anthology of Irish Writing, Volume V, Irish Women’s Writing and Traditions (2002).